Release of a draft Bay Delta Conservation Plan (BDCP) has again been delayed to late January or early February as concerns raised by federal and state fish agencies are addressed and additional analysis is given to proposed downsizing of the plan’s key conveyance facilities. The proposed size of a pair of costly 35-mile-long tunnels to convey water through the Delta to existing federal and state export pumps near Tracy has been reduced from 15,000 cubic feet per second to 9,000 c.f.s. Water exported from the Delta is used for municipal purposes by some 26 million Californians and also provides supplies relied upon to irrigate well over 3 million acres. Governor Brown is championing construction of the tunnel system. By isolating water supply flows from the maze of Delta channels and fragile levees, the conveyance plan would accomplish the same sort of objectives planned for the Peripheral Canal, which voters turned down in 1983. The Natural Resources Agency also announced a cost-benefit analysis of the plan is being undertaken to provide a more complete picture of how the proposed project would help the state as a whole as well as benefit the public water agencies funding the plan under a “beneficiary-pays” concept. The Friant Water Authority has been supportive of the BDCP effort but currently sees little to no benefits to Friant growers and thus has concerns as to how the cost of the facilities may be allocated to CVP water contractors, including the Friant Division. 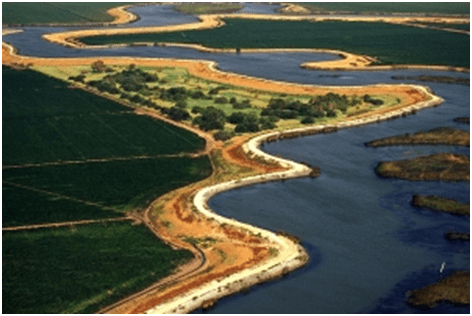 The Delta water provided by the U.S. Bureau of Reclamation to the San Joaquin River Exchange Contractors in exchange for San Joaquin River water diverted into the Friant-Kern and Madera canals already has the highest priority. Meral said the draft BDCP will be for review only, not public comment. Drafts of state and federal environmental studies are expected to be released in late spring, initiating a formal public review period. Along with the conveyance facilities, the BDCP is intended to provide a comprehensive restoration program and meet coequal goals of providing a more reliable water supply for California while restoring and maintaining habitat. The proposal would modify conveyance facilities in the Delta to create a more natural flow pattern. The plan, once finalized and approved, would be implemented over 50 years.